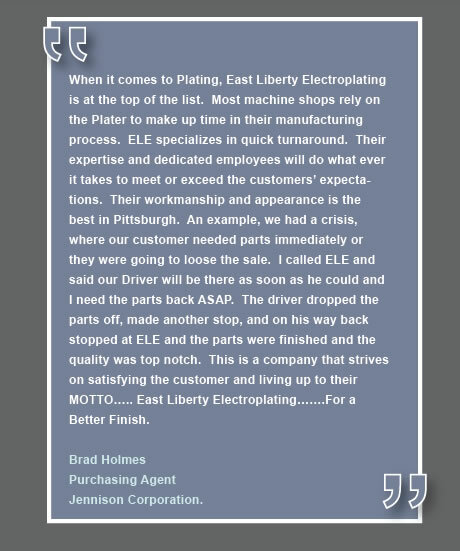 East Liberty Electroplating has been providing quality metal finishing services for regional and national accounts since 1920. Our mission is To provide all customers with first class service and exceptional quality at competitive prices. Expanded facilities and automated equipment under strict laboratory control allow us to provide prompt service without sacrificing quality. ELE is an environmentally responsible company. Strict compliance with applicable federal, state, and local regulations insures that East Liberty Electroplating will be there as a long-term supplier for your finishing needs. Our experienced personnel are available to offer assistance in product design to minimize finishing costs. Our representatives can also provide technical information for a variety of finishes and specifications. East Liberty Electroplating quality assurance program and process control plans insure timely completion of finished parts to customer specification. Personnel are familiar with both military and corporate specifications, including automotive and aerospace. Our goal is to provide "dock to stock" service. ©2011 East Liberty Electroplating, Inc.